Jennifer Fox is an attorney at Huth, Pratt & Milhauser and serves as the Treasurer of the Young Lawyers Section of the South Palm Beach County Bar Association (“YLS”). Throughout the 2017-2018 school year, the YLS made an impact at Pine Grove Elementary School by hosting a school supply drive, a thanksgiving food drive, and a holiday toy drive. In addition, Ms. Fox was chair of the annual Law Day event that was held at the school. 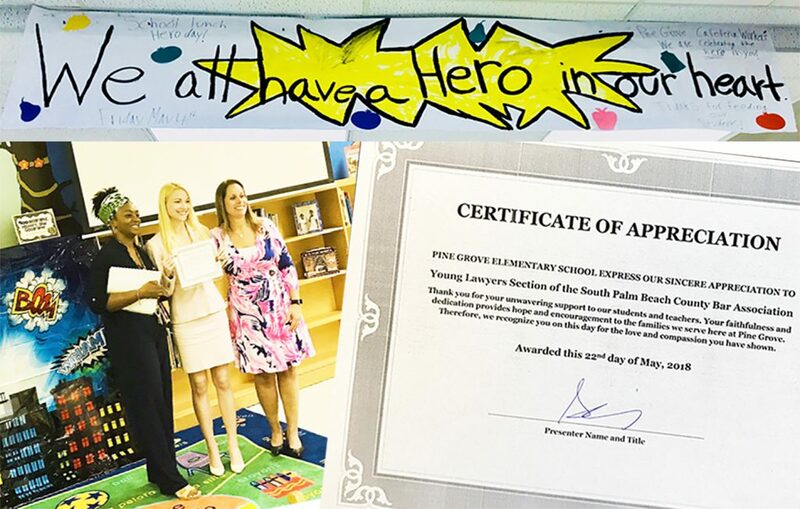 On March 22, 2018, Ms. Fox accepted a Certificate of Appreciation from Pine Grove Elementary School on behalf of the YLS. Congratulations Ms. Fox on making an impact in the lives of children in need.